During 1970 we were getting more work due to joining General Artistes Management. This company was run by Entrepreneur Roger Easterby. Roger was top man as he had all the right connections. He was very successful in getting records played on the radio. Getting airplay was crucial to increase record sales, thereby leading to a position in the charts. Other bands attached to the agency included Vanity Fare and Chicory Tip. We felt there was a real chance of success as Vanity Fare already had records in the charts, most famously "Hitchin' A Ride”, which sold a million copies in America. All we needed now was a good song. This came along soon after in the form of "Sing Along, Sing Along, Sing Along.” It was written by Ed Welch who appeared in the Q Series with Spike Milligan. Sing Along was recorded at Trident Studios, St Anne's Court, Soho. We can be seen at Trident in the picture, on the cover of the sheet music. I only found out today the piano I am playing in the picture was a handmade Beckstein which was over 100 years old. This studio was very popular with many top singers and musicians. I believe that "Hey Jude" was recorded here, most probably played on that Beckstein. Many hit records were crafted in this studio, we were hopeful. This was the first time I felt any pressure in a studio knowing that we had to get the song spot on. I think we played it as a live performance as opposed to laying down separate tracks. Of course the drums were isolated from the rest of us. The bass was fed directly through the console. I believe this was a technique that was first used a few years before. The lead vocalist had some isolation being surrounded by a screen. We were all wearing headphones and could hear the instruments and vocal clearly. The production was overseen by Roger Easterby and Des Champ who was the musician of the two. As mentioned earlier, these two were a winning team having already produced hits for Vanity Fare. I can't explain how great it felt when our finished track was played back to us. We had the usual reviews in the music press namely The Record Mirror, Melody Maker, Disc and Music Echo and The NME. Those reviews were quite positive but not overwhelming. The one in Disc was my favourite as my short piano solo had special mention. We had a terrific amount of plays on Radio One. All the top DJ's played the record. I found out soon after that DJ's didn't usually choose the playlists, they were mainly chosen by the producer of the show with one exception, Emperor Rosko. We were booked into Aeolian Hall, the BBC studio in Bond Street London. 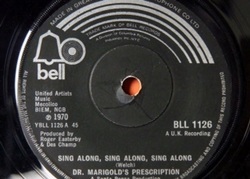 Four songs were usually recorded and then broadcast on Radio One at a later date. The group were announced on air as guests of the DJ. We weren't with the DJ's live, which caused some confusion. We already had experience in BBC studios. When Bruce Channel was here we worked with him at the Charing Cross Studios London, recording six songs which were later played on Saturday Club. The DJ on that occasion was Keith Skues. We recorded in the evening. The songs Bruce sang were "Hey Baby" "Keep On" "Try Me" "Mr Bus Driver" "Land Of Fusan" and "Feel It”, the last two his own compositions. Luckily I recorded these from my radiogram on to tape. I now have them on CD. Rare indeed. After this we were in the studio with Billy Fury. This was at the famous BBC studios in Maida Vale London. I managed to record "Like I've Never Been Gone" and a real rocker "Sticks And Stones" on to tape from this session and now have them on CD too. On the session at Aeolian Hall we recorded among some other songs "Sing Along" and the B side "Farmer Jim" which Fred our vocalist wrote to honour Jimmy Young whose Radio One shows we appeared on many times. The fees for these sessions were around £60+£60 for a repeat. They were often repeated. 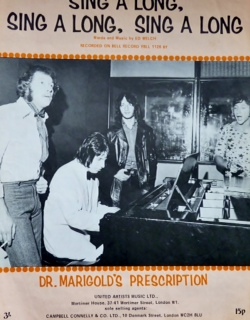 On the 23/10/1970 Dr Marigold's Prescription appeared on the Basil Brush Show, recorded at Shepherds Bush Theatre London. This was to promote "Sing Along". It was the icing on the cake for us, I never ever believed I would be on TV. Mr Derek (Fowlds) was Basil's partner. Another act was "Gentleman Jack” who was in fact Jon Pertwee. The BBC in their wisdom deleted most of these shows so that they are no longer available which is a shame. I heard it was to save money as tape was expensive. One good thing about having a record played constantly on radio, we could put our fees up for live gigs. This eased things a little. Needless to say we never sold enough records to appear on Top Of The Pops, the most important programme to be on. We carried on regardless, looking forward to making the next record.